Fender Vibrolux Model 5F11 Model Tube Amplifier (1960), made in Fullerton, California, serial # F-03931, tweed fabric covering finish. 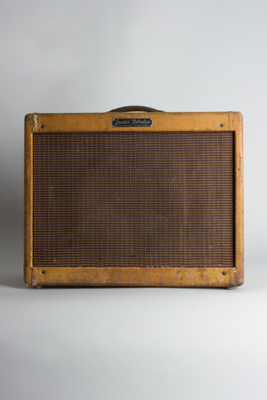 The 1950's tweed Vibrolux is a very different animal than its more common Tolex-era descendant. It is a relatively compact combo amp with one 10" Jensen speaker putting out about 10 watts. The circuit is basically the same as the tweed Harvard with a tremolo feature added, on introduction in 1956 this was smallest Fender amp with built-in tremolo. Unlike the 6AT6/6AV6 first stage found in the Harvard, the Vibrolux uses the dual-triode 12AX7, with the added half powering the tremolo. The rest of the circuit is virtually identical. Also like the Harvard, and unlike many other contemporary Tweed models like the Deluxe, the Vibrolux is a fixed-bias amp, allowing it to have surprisingly high headroom and volume for a dual 6V6 layout. This amp was made towards the end of 1960, a late-era tweed example of an amp that would soon be totally redesigned for the sleeker Tolex 1960's line. This original Vibrolux was on the edge of the student/professional grade amp dividing line in the 1950's but offers plenty of volume for most small gigging and recording situations today, with a tone that's hard to beat. Height is 16 in. (40.6 cm. ), 20 in. (50.8 cm.) width, and 9 1/2 in. (24.1 cm.) in depth at deepest point. This amp is rather well-worn externally with a decent amount of wear to the tweed, which shows quite a bit of darkening and outright dirt overall. The original handle is intact if worn, and all external fittings original except the upper back panel is a modern replacement, expertly aged to match the rest of the exterior. Internally this Vibrolux is a lot cleaner, and has been recently serviced to achieve optimum original spec. It retains the original transformers and Jensen speaker, dated to the 50th week of 1957. A modern grounded three-prong cord has been added, and the "death cap" removed. The filter caps have been replaced, along with some of the coupling caps. The original Selenium rectifier has been replaced with silicone diode, and the amp properly biased for the J&J 6V6 power tubes currently in it. The original parts are still included, bagged up in the back. This amp has a great "Roarin' relic' look with a surprisingly powerful sound that gets a smooth grind when cranked. The tweed Vibrolux is a somewhat overlooked amp, a great find in a gigging and recording tweed Fender with a bit more power in reserve than some of the more familiar late-'50's small-box favorites. Very Good + Condition.